Interview with SECRET STAIRS author CHARLES FLEMING. Plus, stay tuned for a contest! Meet Charles Fleming, author of SECRET STAIRS, at Skylight Books at 5:00PM on Sunday, May 30th! There are certain items Ms. Go Go has in her car at all times. A coffee mug. Red lipstick. An ingenious combination fork/pen. And now, the newest, in-car must-have: Secret Stairs: A Walking Guide to the Historic Staircases of Los Angeles. Because even though Ms. Go Go is lucky enough to have a stairway on her very own street, Charles Fleming‘s Secret Stairs is the best ticket ever to the slightly voyeuristic thrill of wandering through a new neighborhood. Charles has discovered, walked, researched, mapped and measured staircases all over Los Angeles from Santa Monica to Pasadena and all (hilly) points in between. In addition to absolutely accurate route descriptions and directions (so no need to worry that you’re lost or about to clomp through someone’s Zen garden), Charles offers tidbits about the neighborhoods such as the home of the first space tourist (Walk #42 – Pacific Palisades), the location of Vitagraph Studios (#31 – Franklin Hills West) and where to see a plaster mini-Stonehenge (Walk #8 – Highland Park). Charles, who will be discussing and signing Secret Stairs: A Walking Guide to the Historic Staircases of Los Angeles at Skylight Books in Los Feliz on Sunday, May 30th, took time out from searching for new staircases to talk to Ms. Go Go about the book. In the introduction of Secret Stairs, you mention that you were introduced to your first staircase when you lived on a walk-street in eastern Silverlake in 1981. Did you actively start looking for other staircases as a result or did you just happen to find more of them during your neighborhood rambles and become intrigued? I started walking the stairs because I was suffering from terrible back problems, and had found that walking reduced some of the pain. The stairs intrigued me. I made a game of hunting for them, linking groups of them together and making up circular hikes – like the country “pub walk” hikes I had done in England and Ireland. After a while, I had a whole network of urban trails, and was able to take long walks five or six times a week without ever walking the same trails twice. You feature an unbelievable 235 staircases in the book! How many staircases had you discovered before you started planning the book? I originally intended to only write about Silver Lake, which has about 40 staircases. Then I decided to include Echo Park, too, because their staircases are so beautiful. Then it seemed a shame to leave out Franklin Hills, with the fine Radio Walk and Prospect Walk stairs. But then there are the granite staircases of Beachwood … After a while, I decided to do the whole thing – El Sereno, Pacific Palisades, the works! In the end I located over 400 staircases before I sat down to assemble the book. (Since then, I’ve found 20 more.) About 235 of them seemed like good candidates for linking into walks. Many others were too isolated to include. How did you find the Secret Stairs once you started looking for them? Maps? City plans? Antique transportation pamphlets? Strangely, the city does not have a complete staircase map. But I had the benefit of a couple of LA walking books to help me start. And then I had this bad back, which required that I walk an hour or more a day. So I found most of the stairways in the book by driving to an area that seemed likely to have them – a hilly area, developed back when most families didn’t have two cars, when stairs were required to get people down the hill to the public transport lines – and just walking around. I found a few that were indicated on Thomas Bros. maps. I found a few when friends called to tell me about the stairs on their street. Slowly I assembled the full collection. When you actively started mapping the staircases for the book, how long did it take you? I was photographing and mapping the stairs near my area of Silver Lake for about a year before I knew I was going to turn them into a book. It took me another full year to go city-wide, and another six months of really assiduous work to perfect the walks and create a publishable work. Each walk is incredibly detailed and impressively accurate. How many times did you take each walk? It took me quite a while to locate the staircases, and then to connect them into circular walks. Then, once I had designed them, I had to measure them for length and make sure I had the stair counts right – and then walk them again to make extra sure about the directions. I measured the final stair walks at 110 miles total; that means I must have walked 600 miles or more putting the walks together. After the fact, of course, that looks quite insane. I’m glad I didn’t know what I was getting into when I started. Have you found any secret staircases in cities adjacent to Los Angeles such as Glendale or La Canada? If not, why not? And aside from being in hilly areas, why are the staircases concentrated in the areas that they are? There are a few staircases in Glendale, but I haven’t encountered any in La Canada. I think that’s because the hilly sections of those towns were developed after Los Angeles’ great public transportation system had been dismantled and the area has become entirely car-dependent. (The highest concentration of staircases is along the old Red Car lines – Sunset Blvd., Glendale Blvd., Silver Lake Ave., etc.) You can find staircases on the lower sections of some hilly areas, developed up to the 1930s or 40s, but none of the higher sections of the hills where the streets were laid out in the 1960s. By then, everyone was driving, and special pathways for pedestrians were not as necessary. On one of your walks, you were hit by a tumbleweed rolling down the street! Please share your strangest encounters on your walks. Happily, most of my walking was free of that kind of drama. I had a dog lunge at me on the Angelus steps, and almost stepped on a four-foot gopher snake in Baldwin Hills. I had a few locals tell me they didn’t want a book written about their steps. Since the book has been published, I’ve had several happy encounters with people taking the walks with copies of the books under their arms. Aside from the existence of the stairs and the general public’s lack of knowledge about them, what surprised you most on your journey of 21,000 stairs? The botanical and architectural diversity of Los Angeles are amazing to me. So is the remarkable amount of backyard fruit being grown in the city. Everywhere I walked I saw such variety of citrus, stone fruit, predictable things like avocados and unexpected things like papayas. You could eat pretty well just walking the public staircases and subsisting on the fallen fruit. What do you think will surprise your readers the most when they start walking the Secret Stairs? CF: The back country, backyard view of Los Angeles was a surprise to me, as was the sense of going back in time. Since the staircases are old, the neighborhoods are old, and the houses are old. There are a few streets that feel as though nothing has changed in 60 years or more. Also, anyone who lives in a staircase area will almost certainly be surprised to discover stairs, houses and streets they had never seen before. That happened to me, and I’d lived in Silver Lake almost 20 years before I started stairwalking. What are your personal top three favorite staircase walks and why? Oh, man! Do I have to pick? I can’t pick! I love the Happy Valley walk (#10) because it’s an area of LA that I never knew existed. I love the Castellammare walk (#41) because I grew up in Pacific Palisades and I love the look of the ocean and the smell of the sea air. I love the Alta Loma walk (#36) because the area feels so private and secluded. But I like them all! I’m still walking, and I’m excited about new staircases. I’ve already made notes on a new Glassell Park walk that I like, and I keep hearing about staircases in Palos Verdes and San Pedro, and last week I took an insane walk that starts on some historic stairs in Solano Canyon and includes a pedestrian pathway that runs along the 110 Harbor Freeway from Chinatown north, all the way across the mighty L.A. River and into Highland Park. I hope the interest in Secret Stairs justifies a second edition, and gives me the opportunity to design some more walks. 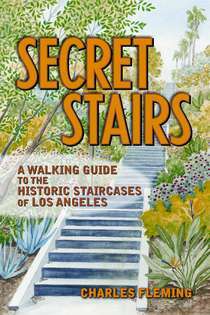 Charles Fleming will be discussing and signing Secret Stairs: A Walking Guide to the Historic Staircases of Los Angeles at Skylight Books in Los Feliz! Previous Post South Pacific on a budget: the Swing Dolls, the USO and a tiki bar. I’m dying to get this book, and I wish I’d published it! Great interview, great idea, and a wonderful celebration of L.A.
Having done several of the walks, I can vouch for what an amazing job Charles has done. It really is a wonderful book. P.S. BTW, my other in-car must-have is a copy of Eat: Los Angeles!